That’s not a matter of chance that Fabra i Coats company imports to Barcelona his management model of times and bodies. The company, a result from the stable union of Sociedad Anónima Sucesora de Fabra and the Portabella and the british group J&P Coats Ltd, it was not only the first foreign investment in Barcelona city, but also the first entity to bring new ways of understanding politics as a performance of times and spaces. The company developed an insertion of reproductive time as a way to improve the productivity, as it was at the final of XIX century in England. We understand a reproductive time as a time dedicated to the citizens and his basic needs to live: food, physical care and health, education, training and social relations with special emphasis on the areas where it happens. This relationship between time and space is revealed through non-productive work, addressed to the procurement of goods and services though salary. The reproductive times are not recognized economically and also maybe socially. 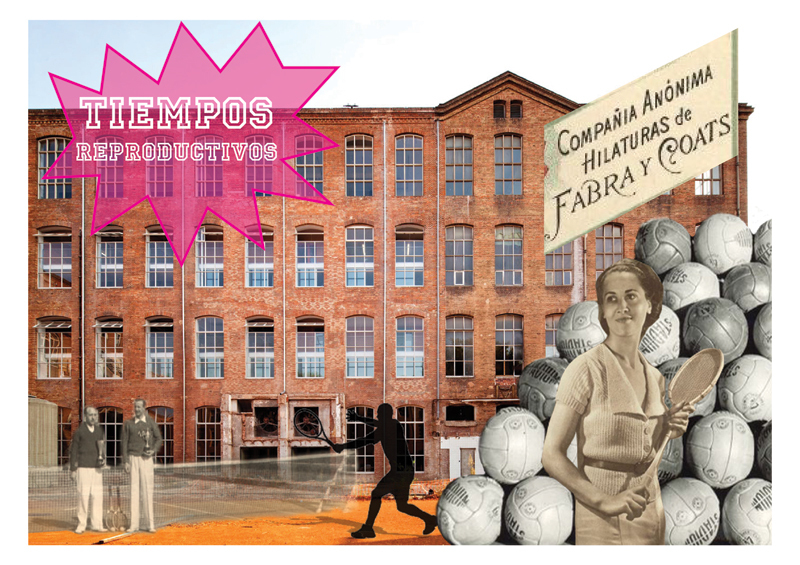 New spaces for the productivity thus appeared in Fabra i Coats from the reproductive, expanding the reach of the company to the associated sports facilities, the soccer field and the Sportiú CD Fabra I Coats Club. Other examples such as the nurseries, the dinings and other spaces complementary to the activity of the company based in the manufacture of fabrics and yarns. This association of the company with the reproductive times has enabled the creation of the association of Amigos de Fabra I Coats, the association of ex workers with more than 40 years. 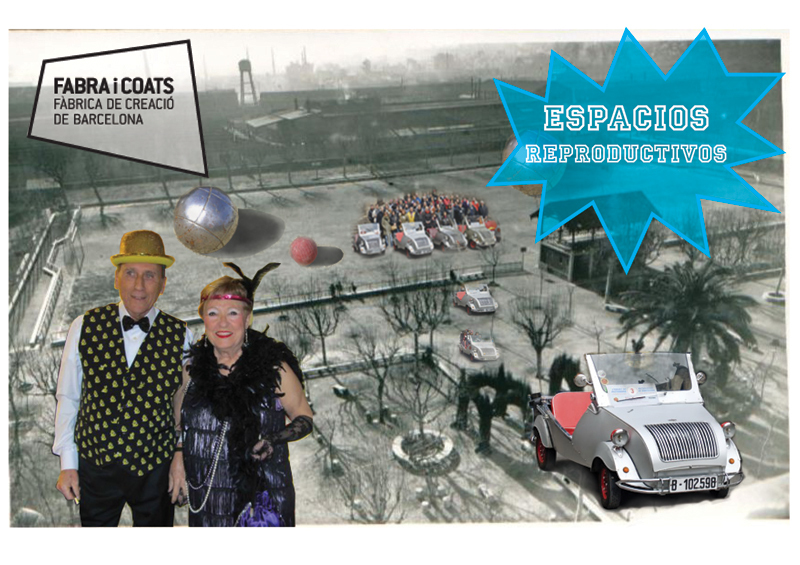 The company, that closed in 1970, has continued this partnership and is currently developing other activities related to hobbies, common spaces occupying the factory with reproductive activities: old fashion 600 cars meetings, “biscuteradas”, carnival celebrations, knotting, the new foundation of Fabra I Coats Sports Club. The company has bound the life of their employees during a time beyond their productive work. We try to unravel the links of the elderly people to the reproductive factory’s spaces and investigate new possibilities of use in areas linked to the current needs of the former employees. These spaces, which are still part of the memory, become a resource of activation and integration into the St. Andreu. The Topias are here, between us and we can do the work of detecting them, working them, developing them and making them visible. The situated knowledge of the former workers is a starter point for the proposal. Mapping the experiences in these reproductive times, its association with invisible spaces of the factory and its environment, and its resources arising from that relationship is the purpose of the project of a non-enough-attended and a hidden reality that we have to work with to create “another” new realities: a new topia. [VIC] Vivero de Iniciativas Ciudadanas is an open-source platform, a collaborative project oriented to promote, spread, analyze and support initiatives and critic processes in a proactive way throughout all the civic society layers, with special incidence in the transferences to the territory, the city and the public space. We observe and mapp citizen initiatives which represents “an alternative way to make things”, incorporating new concepts, agents and initiatives on the social innovation and studying their applicability to projects and proposals (case studies) in the scope of the architecture and the urbanism. We propose projects and strategies or “ways to do” aimed to serve as a bridge between diverse agents who formed the current social network which is being developed. We share the collective knowledge (commons) in diverse workshops, open encounters and forums generating up-to-date bonds in the social layers: listening, studying and proposing routes on specific situations, which allow to merge theory and practice. [VIC] was implanted as an office in the District of Legazpi (Madrid) in 2008, transforming itself into a digital and participating platform since then, generating an ample network of collaborations with diverse participation in projects, workshops, meetings and forums. Previous postENTRANCE STRATEGIES | EME3_2013ENTRANCE STRATEGIES | EME3_2013 Next postDEBATE 1 : THE COLLABORATIVE CITY: TRAINS CRASH OR PEACE PIPE?DEBATE 1 : LA CIUDAD COLABORATIVA: ¿CHOQUE DE TRENES O PIPA DE LA PAZ?